0.8x9.5mm Crypto Cut / DIN Security Level P-6 for information requiring extraordinary security. More Info. The KOBRA 400 HS-Combi is a high security 0,8x9.5mm Crypto Cut shredder, which is suitable for high security combination shredding operations of Optical Media (CD's, DVD's including 80 mm mini disks, Blue-Ray Disks and credit cards) as well as Top Secret paper documents. The KOBRA 400 HS-Combi has been developed to meet the highest security standards of Military Bodies and Government Agencies, where each application requires maximum security. The 400 HS-Combi can shred up to 3000 pieces of optical media per hour through a CD/DVD cutting throat that is 130mm wide. 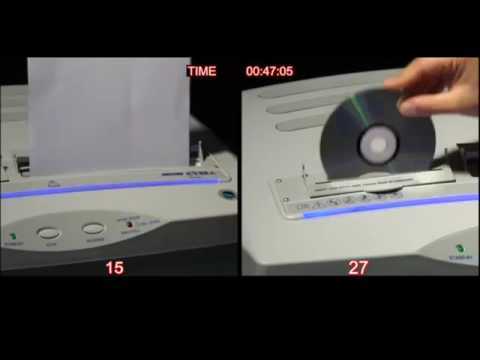 The special 1.5x2.5mm cutting system, the highest security level today available for optical media, can shred an optical media disk into over 3,000 microchips which exceeds the Optical Media Destruction Devices guidelines and the ASIO T-4 standards for TOP SECRET level destruction of Optical Media. Please note to meet CPNI certification we can provide the Optical Media Cutters to provide a shred size of 2x2mm – please specify when ordering. The tiny size of the shreds doesn't allow any possibility to retrieve or read any information left on small optical media particles, even through specific and dedicated electronic equipment. Waste media falls into a reusable waste bag with a volume of 80 litres. A second cutting system provides high security shredding of Top Secret documents. The special integrated automatic oiling system (1 litre capacity) automatically lubricates cutting knives during the operation of the shredder for continuous maximum shredding capacity. The KOBRA 400 HS-Combi is equipped with an Energy Smart system for zero power consumption in stand-by mode and with a powerful 24 hour continuous duty motor. The use of a P-6 shredder such as the 400 HS-Combi will aid your GDPR compliance. Features two entry openings and two sets of cutting knives for separate shredding of paper and CDs/DVDs/Credit Cards. These models also feature a separate waste bin for the second entry throat.